How many colours are used - we can print up to 3 spot colours using flexographic printing. Does your custom printed tape use a flood coated or reverse print? Do you require an inverted unwind (tape comes off the roll opposite direction). Our lead time is 7-10 days from approval of your artwork. The fastest turn around time in the UK! Payment methods - We accept all major credit cards, PayPal, Bacs. credit terms available if approved. Our minimum order quantity is just 36 rolls of custom printed tape and 8 rolls of barrier tape. The lowest in the UK! Full colour proofs are sent to all our customers before the print process begins. We use the pantone matching system just provide your logo or pantone reference and we match it. Our in-house design team can assist if you don't have 'print ready' artwork for your tape design. 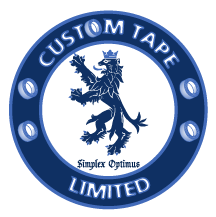 We are proud to be the UK’s #1 leading manufacturer of custom printed tape due to our quality materials, service, commitment and honest price promise guarantee. With our in-house production and design facility we control all aspects of order fulfillment from the placing of your order right through to delivery. We offer our customers quality at superb prices and a first class service which we guarantee to be unbeaten.